Program-related investments (PRIs) are a little-known funding tool with big impact potential for the rapidly growing social innovation sector. The concept is pretty simple: rather than making a grant, PRIs allow private foundations to use the same funds toward certain kinds of loans or equity investments in organizations doing work that aligns with their mission. The really exciting part? They can be made to social enterprises that aren’t nonprofits and still be treated exactly the same as a grant in the eyes of the law. And they’re the next big thing in philanthropy. We would say you should do it because all the cool kids are doing it (think Bill Gates, Ford, eBay founder Pierre Omidyar, etc.). But we don’t want to be that guy. Truth be told, we don’t need to use peer pressure (even though we just gave you a little taste anyway). Because there’s actually really sound logic as to why PRIs make sense (dare we say, even more sense than grants—especially for you bigger-picture-thinking, change-the-world type foundations and social enterprises). Social entrepreneurs are working on bold new ideas that (sorry-not-sorry for the cliché) just might change the world. More and more, the most exciting, forward-thinking social change work is being conducted outside of the traditional nonprofit model, and so traditional philanthropic funding in the form of grants doesn’t necessarily work. (Side note: as discussed here, the alternative, for-profit models being used have potential to create wider-scale, longer-lasting social change.) Wouldn’t it be a shame if some person or entity with the potential to cure cancer or wipe out poverty didn’t do it because they didn’t get the proper funding—simply because their work was too big or too innovative to fit neatly in the traditional “charitable” nonprofit box? Startup and growth capital for social enterprises can be hard to come by. This is generally because: (a) their work is too innovative or early-stage to attract funding from mainstream sources (which often want to see a track record of success before funding, but—and here’s the double bind—proving results takes capital in the first place); or (b) foundations are unaware they can use grant money to support and scale social causes being pursued in non-nonprofit models (or for-profit, if you like that word better). The role of philanthropy is to fill gaps and take risks where others can’t or won’t. It has long been the presumption that where government and corporate-sector spending falls short, philanthropy steps in to save the day. A No-Brainer: More PRIs should be happening if we want to see bigger strides toward change in our world, and foundations are uniquely positioned to meet this need. Want to know more about how to make it happen? Click on the tab for you at the top. If giving large amounts of money to innovative (perhaps even unproven) ideas doesn’t sit well with you, you may want to mull this over for a bit. In the technology sector, budding entrepreneurs are given huge amounts of virtually unrestricted capital. No one really thinks twice about it either. Regular folks like you and me think, “Well, I don’t know how to develop software or build an app for a smart phone. Those tech entrepreneurs are experts and know what they’re doing. I’m sure they need all that money.” And so, regular folks like you and me don’t question it. But here’s something to think about—do you know how to solve poverty? Food deserts? Education inequities? We sure don’t. Which is why it doesn’t make sense for us to decide how much it should cost, or to tell those who’ve spent years working on strategic approaches and best practices to address these problems (i.e. ; experts) how to use the money. Yet this is what happens all too often in the social sector. We’re outsiders here, just like we are to tech, and we’re guessing you are too. While there is something relatable about social issues that makes us feel like we have the right to weigh in (hey, we’re guilty sometimes too), it really should be left to the issue-specific experts. It’s this kind of double standard that has skyrocketed tech innovation and left social innovation largely stagnant for years. Freedom to take risks, dream, and create. Certainly, like tech entrepreneurs, some social entrepreneurs will fail. But some will make it. Some may produce something so great that perhaps our great grandchildren will only read about cancer or homelessness in a textbook. And we think that’s a beautiful thought. The only way to get there is to put the same fervor and support behind the latter type of innovation—social innovation. While this may require some rewiring in terms of how we think about addressing the issues we care about, it’s time we acknowledge the traditional way of making grants to nonprofits has yet to get close to solving any social problems. And that unless we do something different (different types of funding, different types of entities, different regulatory structures), we’re not going to achieve any different results. As we’re pretty sure you’re well aware, you’re legally required to spend a certain amount of your funds every year in furtherance of your mission. Most private foundations meet this requirement by making grants to tax-exempt nonprofits. The other way to meet it is by making PRIs. The way we see it, you have two options with your grant money. Option 1: Go to the window and throw a chunk of it out, never to return. We’ll call this a grant. Option 2: Use that same chunk of money towards a PRI, and have the possibility of getting your money back to reuse for social purposes. If the money is never repaid, nobody gets penalized for anything. The PRI essentially converts to a grant. If you’ve heard about PRIs before, there’s a fair chance you’ve been thinking about them all wrong. 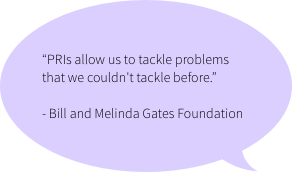 In situations where a return is possible, PRIs are a grant alternative. All that matters is that a return is possible. A good financial return shouldn’t be the primary consideration. With a PRI, you take the same money you would otherwise use towards a grant, and make a low- or no-interest loan or take an equity stake in an entity of your choice (although virtually any financial vehicle will work). There are some rules that need to be followed (read: don’t try this at home), but as long as the funds are being used for a purpose that aligns with your mission and your main focus isn’t making money, the bottom line is that it’s really not that complicated at all. PRIs generate additional capital to help you further your mission. By making a PRI rather than a grant, you gain the chance of recovering your investment plus a reasonable rate of return. As PRIs are repaid, certain portions of the recovered funds must be cycled back out to the social sector. Because there is an expectation of repayment, PRIs help social enterprises build capacity and financial stability. This helps these for-profit social ventures become stronger and more sustainable over time, giving them the potential to make a real dent in social problems, while simultaneously helping you achieve your social mission. PRIs attract additional capital from mainstream investors to help ideas scale. PRI funding provided early on helps absorb some of the potential loss that tends to deter traditional investors (and no sweat off your back, because if the same funds were used for a grant, you’d never see them again anyway). As the PRI helps the social enterprise gain traction, additional investors become more eager to jump on board. When done properly in the hands of the right people, PRIs pose no greater tax risk to foundations than grants. (And if you’ve heard any differently, you’ve been listening to the wrong people). We are legal experts on PRIs, and we’re passionate about using them to change the world. Whether you’re looking to get your feet wet or to do more with your already existing PRI program, we’re your man (figuratively speaking, of course). We’ll answer all your PRI questions, get the transaction done for you, and help you manage the PRI over its life cycle. While PRIs come with a few more requirements than grants, we have good news—that’s our specialty. Because our main goal is to increase the use of this gem of a tool, we work hard to make the process as easy and accessible for you as possible. Not only do you get the benefit of having PRI gurus on your team, we also charge you less than a big wig law firm would to get the deal done (and good luck finding any PRI gurus there). Win-win. Interested, but don’t have a really great for-profit social enterprise to fund? No problem. We’re developing a platform that will help you link up with potential PRI recipients that align with your mission. As a non-nonprofit social enterprise, we know finding funding is a challenge. That’s what’s so great about PRIs—they help fill this gap. PRIs allow private foundations to provide startup or growth capital to social enterprises doing work that aligns with their mission (the same funds they would otherwise use for grants). This is generally done in the form of low- or no- interest loans or equity stakes. As opposed to funding from traditional investors, PRIs come with much less of a burden and much fewer strings attached. You can use the investment on a new idea—a potential groundbreaking solution to a long-standing social issue—something that would be much harder to do with an investment from a traditional lender or investor (largely because traditional investors require you to go the safer, less risky route in order to guarantee them a financial return). With PRIs, the primary return foundations are seeking is social benefit, with any financial return being an added bonus. For innovative social enterprises, the opportunity to take a risk here is a huge upside. The challenge now is to get foundations and social enterprises (1) in the “know”; and (2) working together. Our goal is to build a platform where we can connect private foundations that want to fund innovative ideas with social enterprises in need of funding. If you’re a for-profit social enterprise working on something BIG (or know of one that is), reach out to us—we’d love to hear what you’re working on! And if all goes well, we may be able to transition you to the next phase: hooking up with some capital to seed or scale your ideas in the hopes of bringing about truly transformative change. Fill us in by submitting the info sheet below. (If you have something else you want to talk about, holler at us over on the contact page). © 2019 Social Innovation Strategies. All rights reserved.